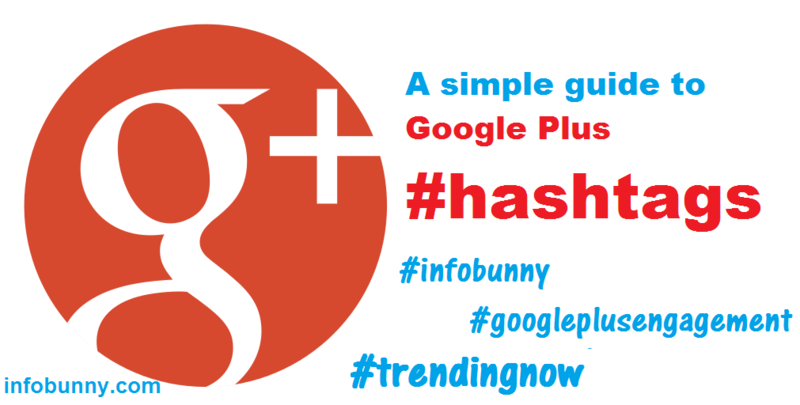 As an example, i have shared this post to Google Plus and used the hashtage #infobunny, click the hashtag and you will find my shared post and if you type the hashtag into the search box at the top of Google Plus you will also find my post and any others posts i have made that use the same hashtag. To create a hashtag all you have to do is add the # symbol before the tag word so for example #infobunny or #googleplusengagement. Each hashtag then becomes a clickable link and will show a page with all the posts that have used that hashtag. 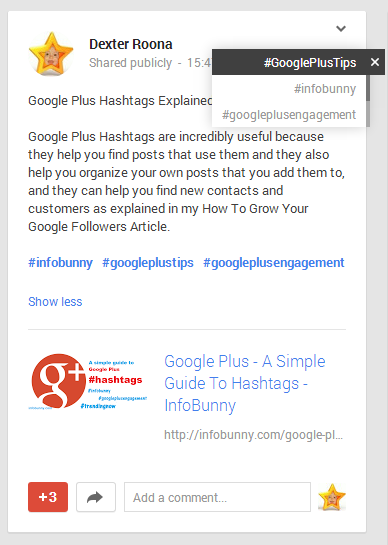 Google Plus shows the first 3 hashtags that you have used on a post as Related HashTags, they show on the right at the top of your post. Click on one of them and the post will flip around and show you other posts that have used the same hashtag. As mentioned Google Plus shows 3 hashtags as standard and as a rule is probably a good idea to keep it just to 3 hashtags so as not to be flagged for hashtag spam. Hopefully you now have a full understanding of how hashtags work. Make sure you checkout my other related Google Posts below.